Objective: The aim of this study was to assess the comorbid psychiatric disorders in children with intellectual disabilities (ID) and to evaluate the relationship between comorbid psychiatric disorders and mothers' anxiety depression level. Materials and Methods: 80 participants and their mothers whose ages are between 0-18 years and are diagnosed with intellectual disability and 60 healthy participants aged between 0-18 years without any chronic physical and psychiatric disease and their mothers were included in the study. A psychiatric interview according to DSM-5 diagnostic criteria was conducted to determine if there is a comorbid psychiatric disease with the cases in the patient group. A sociodemographic data form and Beck Depression Scale and Beck Anxiety Scale were given to the subjects in both groups in order to determine the anxiety depression level of the mothers. Results: The anxiety and depression levels of the mothers in the ID group were found to be higher than those healthy and controlled mothers (p<0.001 for both). In addition, 55.6% of the cases in the ID group were detected to have comorbid psychiatric disease. Mothers with comorbid psychiatric disorders had higher anxiety depression scores than those without comorbid psychiatric diagnosis (p<0.001 for both). Conclusion: In this study, a high rate of comorbid psychiatric disease was found in children with ID. However, anxiety depression levels were higher in mothers of patients with comorbid psychiatric disorders. Comorbid psychiatric diseases cause more psychological burden on the mothers, therefore it is important that these children be assessed in this respect and to make the necessary interventions. Amaç: Bu çalışmada zihinsel engellilik (ZE) tanısı alan çocuklarda komorbid psikiyatrik hastalıkların ve komorbid psikiyatrik hastalıklarla annelerin anksiyete depresyon düzeyiyle ilişkisinin değerlendirilmesi amaçlanmıştır. Gereç ve Yöntemler: Çalışmaya Zihinsel Engellilik tanısı alan 0-18 yaş aralığındaki 80 olgu ve anneleri ile herhangi bir kronik fiziksel ve psikiyatrik hastalığı olmayan sağlıklı 0-18 yaş aralığındaki 60 olgu ve anneleri dahil edildi. Hasta grubundaki olgularla komorbid psikiyatrik hastalık olup olmadığını belirlemek amacıyla DSM-5 tanı kriterlerine göre psikiyatrik görüşme yapıldı. Her iki gruptaki olgulara sosyodemografik veri formu ve annelerin anksiyete depresyon düzeyini belirlemek için Beck Depresyon Ölçeği ve Beck Anksiyete Ölçeği verildi. Bulgular: ZE grubundaki annelerin anksiyete ve depresyon düzeylerinin sağlıklı kontrollerin annelerine göre daha yüksek olduğu belirlendi (her ikisi için p<0.001). Ayrıca ZE grubundaki olguların %55.6‘sında ek psikiyatrik hastalık olduğu saptandı. Ek psikiyatrik hastalığı olanların annelerinde komorbid psikiyatrik tanısı olmayanlarınkine göre daha yüksek anksiyete depresyon skorları saptandı (her ikisi için p<0.001). Tartışma: Bu çalışmada ZE tanılı çocuklarda yüksek oranda komorbid psikiyatrik hastalık oranları saptandı. Bununla birlikte komorbid psikiyatrik hastalığı olanların annelerinde anksiyete depresyon düzeyleri daha yüksekti. Eşlik eden psikiyatrik hastalıklar anneler üzerinde daha fazla ruhsal yüke sebep olmakta olup bu çocukların bu açıdan değerlendirilip gerekli müdahalelerin yapılması önem arz etmektedir. 1. Durukan İ. Zeka Geriliği (Zihinsel Engellilik). Çocuk ve Ergen Ruh Sağlığı ve Hastalıkları, Akay AP, Ercan ES, Perçinel İ, Ardıç ÜA, Güney SA, Demirkaya SK, Güler AS, Yazıcı KU (editörler). Ankara: Türkiye Çocuk ve Genç Psikiyatrisi Derneği Yayınları:9, 2016: 114-125. 2. Şengül ŞS. Zekâ Geriliği Olan Çocuklarda Tamamlayıcı ve Alternatif Tedavi Uygulamaları. Anadolu Psikiyatri Derg 2009; 10 (1):24-25. 3. American Psychiatric Association Diagnostic and Statistical Manuel of Mental Disorders. Fifth Edition (DSM-V) American Psychiatric Publishing; Washington DC, London England; 2013. 4. Lakin KC, White CC, Hill BK, Bruininks RH, Wright EA. Longitudinal change and inter state variability in the size of residential facilities for persons with mental retardation. Ment Retard 1990; 28 (6): 343-351. 5. Zahir FR, Mwenifumbo JC, Chun HE , Lim EL, Van Karnebeek CDM, Couse M. Comprehensive whole genome sequence analyses yields novel genetic and structural insights for Intellectual Disability. BMC Genomics 201; 18 (1): 403. 6. Volkmar FR, Dykens E. Mental Retardation.In: Levis M, (ed). Köroğlu E, (çev) Child and Adolescent Psychiatry. Philadelphia. Lippincott Williams and Wilkins; 2003 : 603-611. 7. Uguz S, Toros F, İnanç BY, Çolakkadıoğlu O. Zihinsel ve/veya Bedensel Engelli Çocukların Annelerinin Anksiyete, Depresyon ve Stres Düzeylerinin Belirlen-mesi. Klinik Psikiyatri 2004; 7:42-47. 8. Hanson MJ, Hanline MF. Parenting a Child with a Disabilities:a Longitudinal Study of Parental Stress and Adaptation. J Early Intervention 1990; 14(3):234-248. 9. Bilal E, Dağ İ. Egitilebilir Zihinsel Engelli Olan ve Olmayan Çocukların Annelerinde Stres, Stresle Başa Çıkma ve Kontrol Odağının Karşılaştırılması. Çocuk ve Gençlik Ruh Sağlığı Dergisi 2005; 12(2):56-68. 10. Şengül S, Baykan H. Zihinsel Engelli Çocukların Annelerinde Depresyon, Anksiyete ve Stresle Başa Çıkma Tutumları. 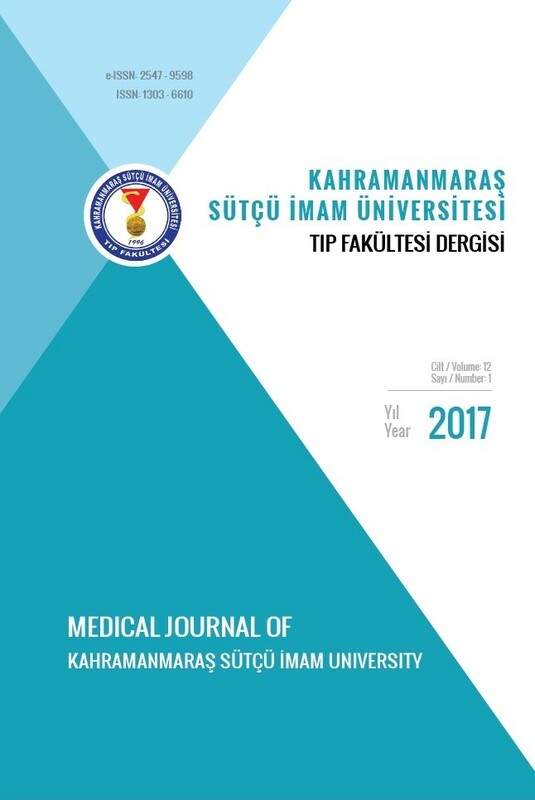 Kocatepe Medical Journal 2013; 14: 30-39. 11. Dyson LL. Families of Young Children with Handicaps: Parental Stress and Family Functioning. Am J Ment Retard 1991; 95:623-629. 12. Dyson LL. Fathers and Mothers of School-Aged Children with Developmental Disabilities: Parental Stress, Family Functioning and Social Support. Am J Ment Retard 1997; 102:267-279. 13. Özsenol F, Isıkhan V, Ünay B, Aydın Hİ, Akın R, Gökçay E. Engelli Çocuğa Sahip Ailelerin Aile İşlevleri-nin Değerlendirilmesi. Gülhane Tıp Dergisi 2003; 45(2):156-164. 14. Azeem MW, Dogar IA, Shah S, Cheema MA, Asmat A, Akbar M, et al. Anxiety and depression among parents of children with intellectual disability in Pakistan. J Can Acad Child Adolesc Psychiatry. 2013; 22(4):290. 15. Savaşır I, Sezgin N, ve Erol N. Ankara Gelişim Tarama Envanteri El Kitabı.Ankara: Ankara Üniversitesi Tıp Fakültesi; 1995. 16. Savaşır I, & Şahin N. Wechsler Çocuklar için Zeka Ölçeği (WISC-R). Türk Standardizasyonu. Ankara: Milli Eğitim Basımevi; 1988. 17. Beck AT, Steer RA, Ball R, Ranieri W. Comparison of Beck Depression Inventories -IA and -II in psychiatric outpatients. J Pers Assess. 1996; 67(3):588-593. 18. Beck AT, Ward CH, Mendelson M, Mock J, Erbaugh J. An inventory for measuring depression. Arch Gen Psychiatry. 1961; 4:56156-4. 19. Beck AT, Guth D, Steer RA, Ball R. Screening for major depression disorders in medical inpatients with the Beck Depression Inventory for Primary Care. Behav Res Ther 1997; 35:785-790. 20. Ulusoy M. Beck Anksiyete Envanteri: Gecerlik ve guvenirlik çalışması. Yayınlanmamış uzmanlık tezi. Bakırkoy Ruh ve Sinir Hastalıkları Hastanesi, İstanbul,1993. 21. Gohel M, Mukherjee S, Choudhary SK. Psychosocial impact on the parents of mentally retarded children in Anand District. Healthline 2011; 2(2): 62. 22. Majumdar M, Da Silva PY, Fernandes J. Stress and anxiety in parents of mentally retarded children. Indian Journal of Psychiatry 2005; 47(3):144-147. 23. Upadhyaya GR, Havalappanavar NB. Stress in parents of the mentally challenged. Journal of the Indian Academy of Applied Psychiatry 2008; 34(special issue):53-59. 24. Bitsika V, Sharpley C. Stress, anxiety and depression among parents of children with autism spectrum disorder. Australian Journal of Guidance and Counselling 2004; 14(2):151-161. 25. Dharmadhikari AS, Sinha VK. Psychiatric comorbidity in children with epilepsy: A cross-sectional 5 years rural prevalence study. J Neurosci Rural Pract 2017; 8 (2):179-184. 26. Lakhan R. The coexistence of psychiatric disorders and intellectual disability in children aged 3–18 years in the Barwani District, India. ISRN Psychiatry,2013 May 7;2013:875873. doi: 10.1155/2013/875873. 27. Arıcı A, Altun H, Sevgen FH. Çocuk psikiyatri polikliniğine başvuran zihinsel engelli hastaların başvuru şikayetleri ve komorbid tanıları. Journal of Mood Disorders 2017; 7(4):199-204. 28. Baker BL, Blacher J, Crnic KA, Edelbrock C. Behavior problems and parenting stress in families of three-year-old children with and without developmental delays. American Journal on Mental Retardation 2002; 107:433-44. 29. Baker BL, McIntyre LL, Blacher J, Crnic KA, Edelbrock C, Low C. Preschool children with and without developmental delay: behavior problems and parenting stress over time. Journal of Intellectual Disability Research 2003; 47:217-30. 30. Hastings RP. Stress in parents of children with autism. In E. McGregor, M. Nunez, K. Williams, & J. Gomez (Eds. ), Autism: An integrated view. Oxford: Blackwell; 2008:303–324. 31. Herring S, Gray K, Tonge B, Sweeney D, Einfeld S. Behaviour and emotional problems in toddlers with pervasive developmental disorders and developmental delay: Associations with parental mental health and family functioning. Journal of Intellectual Disability Research 2006; 50:874–882.